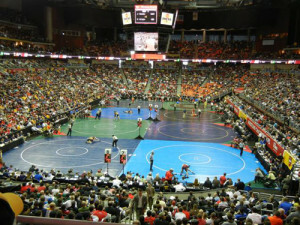 When the traditional state wrestling opens on Thursday there will be 24 defending or former champions the field and many others with the goal of getting there for the first time. One of those looking for the first gold medal is English Valley’s 152 pounder Zach Axmear who will take a 49-0 record into Thursday night’s class 1A opening round. “He hasn’t had very many matches under a major decision yet this year and we’ve met some pretty good kids this year. He’s just solid and he’s put some work in..he goes to camps and clubs, he’s just moving in the right direction,” according to English Valley’s coach Brock Moore. As a freshman last season Axmear made it to the semifinals at 145 pounds before falling to Bryce Paul from Alburnett. Moore believes Axmear can make it to the top of the podium this week. He says as a coach he believes Axmear has the best draw he could have and if they get to the semifinals he could face Paul again, and Moore says that would be a different match than last year. 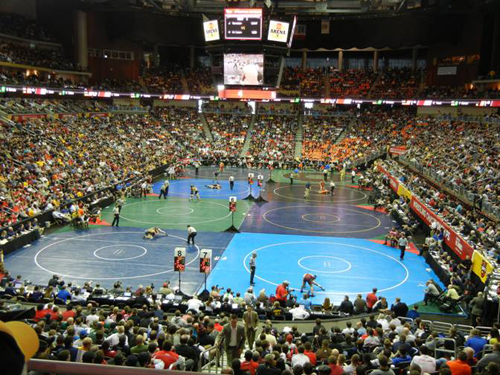 The traditional state tournament begins Thursday morning with the opening round in class 3A. Tomorrow afternoon will feature the opening round in 2A.